Apple raised the eyebrows of the advertising world in October 2005 with the release of “Detroit”, an silhouetted performance by rapper Eminem. 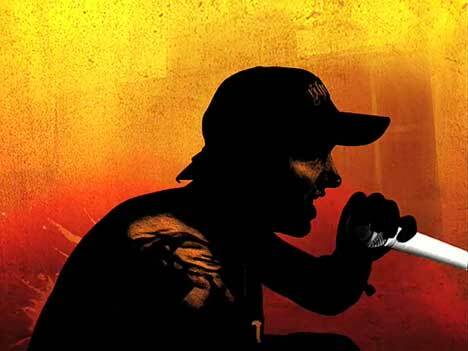 The spot was recognised at first for its achievements – getting Eminem to agree to endorsing the iPod and the creative skills demonstrated in the visual effects. However it wasn’t long before commentators started making comparisons between the Detroit spot and the 2002 “Arrow” spot for shoemaker Lugz. After complaints from advertising agency Avrett Free Ginsberg, Apple withdrew the Eminem spot from its place on the Apple web site, replacing it with the U2 video and Wynton Marsalis ad. Three men wearing Lugz footwear demonstrate their breakdance moves to the sounds of New York hip hop rap DJ Funkmaster Flex (Aston Taylor). The first dancer stands on a New York rooftop looking out over a Manhattan cityscape. A black graffiti arrow follows the track made by his spinning Lugz shoes before breaking free and heading down to the street. A dancer on a pedestrian crossing is caught up in the black arrow’s movements before sending it to a railway station platform. The third dancer plays with the arrow before boarding his train. As the last carriage pulls out the Lugz logo appears on a platform advertising board. The Lugz Arrow campaign, released in TV and print in August 2002, was developed at advertising agency Avrett Free & Ginsberg by creatives Rory Braunstein and Scott Barbey. The Lugz Arrow TV ads were directed, designed and animated by a team at Psyop, New York, under the leadership of director/designer Marie Hyon and animation director Marco Spier, executive producer Justin Booth-Clibborn. The music used in the Lugz Arrow clip was prepared exclusively for Lugz by Funkmaster Flex. 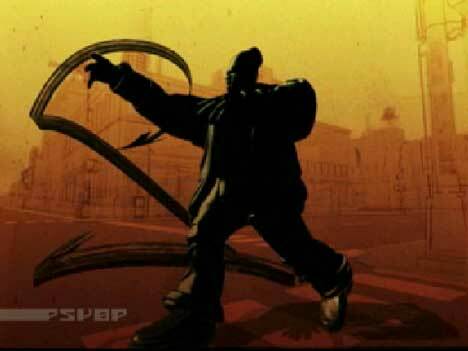 An animated Eminem in silhouette sings “Lose Yourself”, dancing through the red, yellow and black streets of Detroit with a white microphone. Each footstep leaves a white splash of paint on the ground. He’s joined by silhouetted dancers with white iPods. The scene is enhanced with black and white grafitti-style scrawls. At 20 seconds we’re given a red screen with the words, “Eminem, Curtain Call – The Hits”. At 24 seconds, “iPod + iTunes”. At 28 seconds, a white Apple logo on red background. In February 2004 Eminem’s company Eight Mile Style had taken out a lawsuit against Apple, TBWA\Chiat\Day and MTV for using ‘Lose Yourself’ in an online advertising featuring a 10-year-old boy rapping the Eight Mile High song, ‘Lose Yourself’. Although the advertising agency had asked for permission to use the song and had received a ‘no’, Apple (read Steve Jobs) had pushed ahead on the campaign. See MacMinute’s take on the lawsuit. Apple reached an amicable out-of-court settlement with Eight Mile Style in May 2004. When the Apple Detroit ad appeared on Apple’s web site, a number of advertising bloggers commented on the similarities between it and the Lugz Arrow commercial. See the breaking article at Adfreak. The Apple Detroit ad was developed by TBWA\Chiat\Day by worldwide chief creative officer Lee Clow, creative directors Duncan Milner and Eric Grunbaum, art director Demian Oliveira, copywriter Krista Wicklund, executive producer Cheryl Childers, agency producer Mike Refuerzo, and assistant producer Serena Auroux. Filming was directed by Mark Romanek via Anonymous Content, with producer Scott Kaplan, executive producer Lisa Margulis and director of photography Jim Healy. Apple Detroit was edited at Nomad Editing Company by Glenn Martin, with assistant editor Matt Dunlap, music editor Francois Blaighan and music assistant Tom Stamatio. Design, animation and visual effects were done at Logan by Alexei Tylevich and Ben Conrad, with grafitti style graphics by Eric Haze. Post production at Company 3 was done by special effects artist Alex Brodie and colorist Stefan Sonnenfeld. The lyrics used in the clip are highlighted in red.